She'd rather pay $25k more to someone than pay the Court $500 for video equipment for the trial?! I don't get it but yay! That frees up the first 2 weeks of May! Can I take leave? I really believe that learning to handstand can break your fears in life. I actually do believe that as well. Going into an inversion automatically changes the way you feel about a lot of things. And the euphoria you feel when you lift off is just…indescribable. So I went to Court super early in the afternoon for a pre-trial conference because my opponent's secretary called and told me about it. She was supposed to check the location and let me know as well but she didn't. In this same afternoon I have a whole buncha files to attend involving showing accudent videos. So I packed all the files and my laptop into my court bag and went off for the PTC. Because I was carrying my laptop, my first stop in Court was the Bar Room. I fished out my PTC file then left the bag in the Bar Room and headed upstairs to find the PTC Court. After being oppressed for half an hour, I returned to the Bar Room for the rest of my afternoon files. To my utter shock and horror, I find the lights off and the door locked with a sign "[Bar Room Uncle] is not feeling well and has gone to the doctor." So I started freaking out given that my work laptop and all my un-done afternoon files are all inside! Luckily, some calm and kind dude came along and suggested that I check with the security counter about unlocking the Bar Room. Which they did. So my afternoon was saved. But because of the whole fiasco, I ended up at the end of the evil Wednesday afternoon queue and didn't finish until very late. So I cancelled yoga class (thinking I could join Overlord, T, V and J for drinks after all) only to return to the office to find out that Overlord has completely forgotten about drinks. So I stayed late and signed a buncha letters. It is amazing how everyone automatically peers out of my window when I say "I can see my house!" And no, I can't actually see my house. It is a Warcraft 2 Flying Machine reference that no one gets and I wonder why I even bother making. Like how when T says "I need to call Alice." I'll reply, "Who the f* is Alice?" Overlord: Why can't you do drinks tomorrow? Me: Because jumping into a hand stand is a very important part of my life. Apparently on the way home from school, the kiddies ran off without my father and my father yelled at them. These kids are really beginning to answer back. So T and I started talking about Lavender the other day and I remembered the container of lavender that Patrick the Chef gave to me. "I've got a small container of lavender lying around some where. Do you want it?" "I've got a 5kg bag of lavender! I bought it for my mother years ago and we still haven't done anything with it!" "You could make lavender chocolate cake! I haven't made one of those in years!" 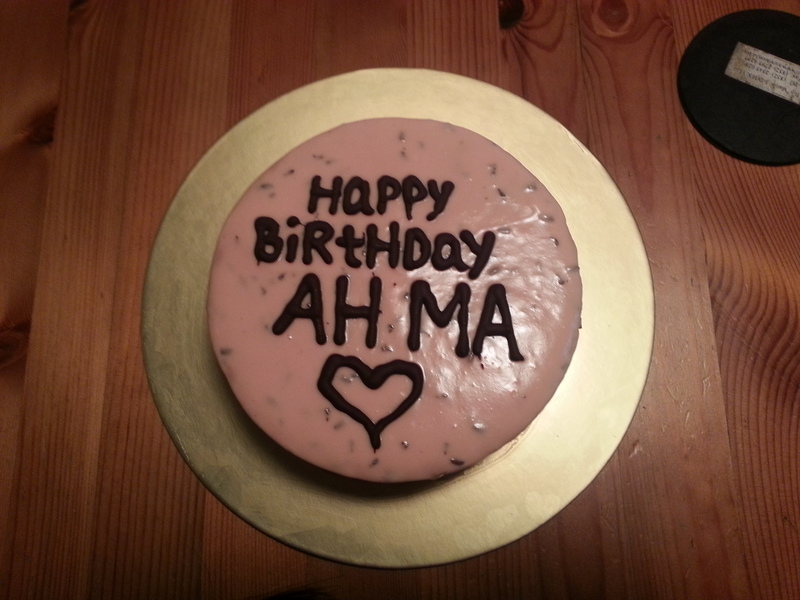 So today, I made a lavender chocolate cake for my mother-in-law. Dad: Why do I have to keep telling you not to make a racket in the corridors? A: Because I am a kid! "I want to lose weight to look hot." "I want to lose weight to fit into my pre-pregnancy clothes so that I don't have to buy a whole new wardrobe." "I want to lose weight so that I can lift my entire body weight into a forearm stand." "Mummy, I had fun today." Then he put on his sunglasses and stared out into the night.